*Need: Drying rack or metal grate to put on top of baking sheet and aluminum foil to protect the pan. 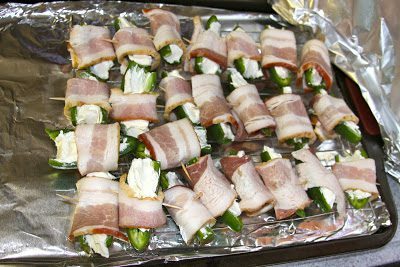 Preheat the oven to 375 degrees (unless grilling). 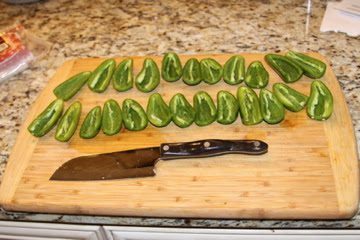 Slice each jalapeño down the middle and remove both the stem and the seeds. To remove the seeds you can either use a spoon or your finger. If desired, this step can be done while wearing latex gloves, but whatever you do don’t rub your eyes after handling the pepper seeds! 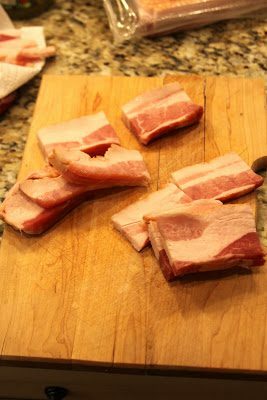 Cut the raw bacon in thirds. 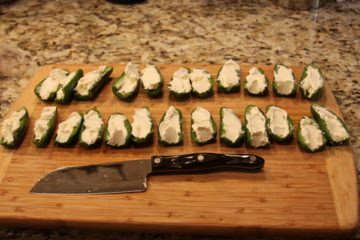 Using a spoon, fill the jalapeño halves with cream cheese. 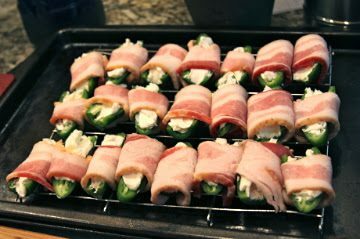 Wrap one small piece of bacon around each cream cheese-filled jalapeno with the bacon seam on the bottom. Protect the baking sheet with a piece of foil and place a drying rack or other cooking rack on top of the foil-lined baking sheet. 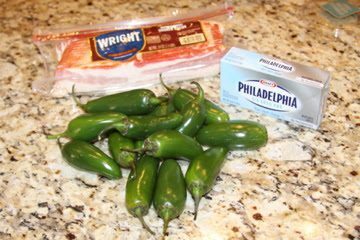 Place the completed jalapeños on the rack so the bacon grease can drain onto the foil. 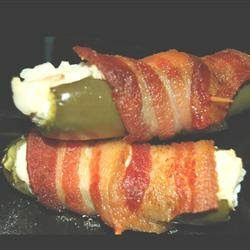 Then EITHER bake at 375 degrees F for 20 – 25 minutes or until the bacon looks brown and crisp, OR place on a grill over high head, and cook until bacon is crispy. *NOTE: I used thick sliced bacon, so if you go that route, it may take a bit longer to cook.